A couple of weeks ago, I got an email from one of my Blog reader asking about any good webmaster forums in my knowledge which I would recommend him to join. On drilling down his email further I figured out he got frustrated of being member to many of known webmaster and technology forum's. He just want to concentrate and get active on limited but informative forum's. It's all about quality information online not quantity. I think we all look for same, being a Online Marketer I do want to utilize my limited time getting involved on useful webmaster forum's. Certainly maximum percentage of online user's are wasting there time on worthless site or forum's, that's what make them frustrated or divert their interest's to look for another new source online. There are so many forum's available online where you will notice instead of logical or materialistic discussion, they are involved in promoting their own products or services or you'll find many forum member's are promoting themselves, serving outdated information or discussing on how to make money online or even involved in personal attack's violating forum rule's. Honest members who joined the forum's looking for real information or want to share/discuss their problems are not getting answered. All such scenario makes them looking for another forum...and so on 90% of forum member's leave them straight away and hop to another forum. Again same situation which make them to jump over another forum. I believe it's better to pick out best online site's, forum's, blog resources based on our interest and get active out there. Investment of time on best informative forum's is like a investment of your precious time and money, so pick them wisely. Back to my Blog reader email, he has been asking me for webmaster forum's which I would recommend him to Join where he could find good information on Online marketing subject along with a mix of other interesting Tech related topics. LovingTech is the best place where as a member you can discuss on everything from Webmaster and Tech, including; Internet Marketing, Computers, Gaming, Search Engine Optimization and Web Design. 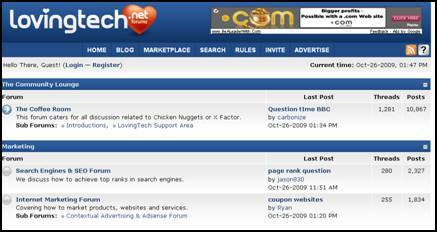 Apart I am much impressed with LovingTech Forum's simplicity, user-friendly design, motto of being single quality forum source on all tech & webmaster related discussions. LovingTech Forum is so rich with all useful content of being the active participation and moderation from Forum Administrator, Ryan Grant - founder and owner of Lovingtech forum. If you are Technology Geek and love to have discussion on latest technologies or like Gaming, love to share and discuss on Apple, MicroSoft products LovingTech.net Forum is for you. If you are Online Marketer or Webmaster and wish to discuss with fellow like minded people more on Web Design & Graphics, Coding & Web Development, Internet Security, Online Marketing & Search Engine Optimization, you will find only interested and informative people out there at LovingTech Forum. Please subscribe to TopRankSEO Blog RSS feeds, also you can Visit the blog page on Facebook to see who's following this blog. Search Engine Marketing Professional, SEO Expert, Professional Blogger who specializes in SEO (Search Engine optimization), PPC, Social Media Optimization (SMO), Blog Marketing, Search Marketing Strategy & Positioning. If you want to learn or want any help in building your website/blog/forum online presence, you can contact me any time.